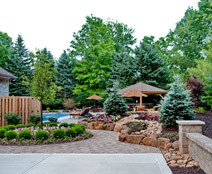 McCune Outdoor Living was founded in 1993 by Chad McCune. In an industry where companies come and go each season, it is comforting to work with a service provider that has been in business for so long. We pride ourselves in staying close to our customers, providing the personal attention needed to guarantee that each project is completed to the customer’s satisfaction. Chad is a 1992 graduate of Indiana University. He has been in the landscaping business since 1987, starting his own business in 1993.